How Does Sharapova Deal With Losing? Winning is important for many tennis players. Winning can become so important that tennis players focus too much on winning during the match. Thinking too much about the outcome distracts players from the present moment and can be a source of stress. For example, some junior tennis players worry about disappoint a parent if they lose a match they are expected to win. When you win matches, you obviously get a boost of confidence. Winning matches can validate your hard work and dedication. But not everyone can win in a single tournament – you only have one winner. In a draw if 32 players, 31 players are out played. Professional tennis player, Maria Sharapova is no exception. In her career, Sharapova has lost 70 matches! Wow, that sounds like a lot of lost matches for a player that held the number one ranking for 17 weeks on the WTA. Some tennis players dwell on their losses, which tends to undermine their confidence. They may carry their last loss with into the next tournament and doubt their skills. When players dwell on their losses and mistakes, they can become frustrated, lose motivation, and even lose confidence. The top tennis players with mental toughness learn use losing as a way to rebound, learn how to improve, and become more mentally tough. Maria Sharapova doesn’t like to dwell on her losses. Instead, she uses them to prepare better for her next tournament. How does Sharapova get over losses? She doesn’t look at losing as a failure. Instead, she looks at losing as a learning opportunity; a way to get better for the next tournament. Losing motivates her to work hard and improve the weaker areas in her game. Sharapova’s outlook on losing comes from her experience and tennis mental toughness. When Sharapova is losing in a game, she doesn’t lose her cool. 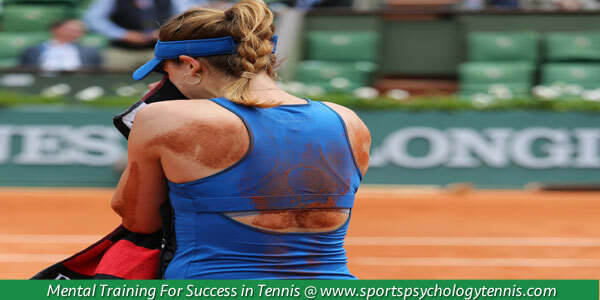 Tennis players with mental toughness don’t hang their head over defeat and lose confidence. They do something about it… They bounce back stronger with renewed commitment. When you play a sport where you lose more tournaments than you will win, you have to maintain a positive outlook on your game or you’ll get swept away by doubt. Always focus on two things you did well in every match, win or lose. Learn from your mistakes, but don’t beat yourself up over them. Honestly assess what you need to work on in practice to improve your strokes and mental toughness and set a plan to help you improve these areas of your game. In the next tournament, you’ll be a better player for it.